Turini is a real legend among the WRC stages. WIth a length of approximately 32 km it is run between Sospel and La Bollène passing over the most famous mountain top of the WRC, Col de Turini. Depending upon the year, the stage starts in Sospel and finishes in La Bollène or is run in the other way (La Bollène to Sospel) but still being just as difficult. Here we will study the stage in the direction Sospel - La Bollène. Subject to vertigo or dizziness please stay home ! The final part of the stage is very fast and demands 100% concentration. The stage ends in La Bollène. All of this can be seen in pictures here. During this stage's history, drivers have always driven over the Col de Turini but the rest of the stage might have varied a little. Some years it started from Moulinet, other years from Peira Cava and it has been run in reverse some times but the charm and beauty always remained intact. The Turini is also the stage which gave its name to the famous and mythical Night of Turini which is unfortunately dead today. Many things have happened on this stage, both good and bad. The stage has created legends and destroyed others. These 32 km cover so many great moments (and bad). Discover some of them in the Great Moments. 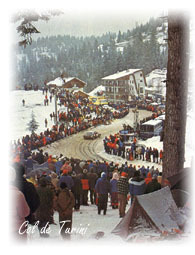 Each year, thousands of fans participate to the show on the Col de Turini. They gather behind the barriers, on cottage roofs, on hotel balconies and on the nearby ski slopes to admire the passage of the WRC stars, or to encourage friends that have taken part in the adventure. Snow, wind or rain, day or night, nothing changes, people go back there every year. You must understand that, on this stage, the most important is to not leave the road and to not lose time ! 32 : approximate distance of the stage in km (Sospel - Col = 20 / Col - La Bollène = 12). 1607 : highest point of the stage : Col de Turini. 1200 : approximate height in metres the WRC cars climb from Sospel to Col de Turini. 910 : approximate height in metres the WRC cars descend from Col de Turini to La Bollène. 34 : number of hairpins on the stage. 104 : number of times a stage has passed trough Col de Turini since 1962 (including 2006). I often write "approximate" because the departure and arrival points of the stage change each year.